My family told me about the website. I lived in Wrington until 1967 when I emigrated to Australia. I still have happy memories of the time spent in the village. Hi Richard, have just been looking at the schmoose page, and the picture sent by Judi Pegg of the cottage in Wrington made me sit up. I think it could be Linden Lea, Cox's Green, where I lived for 12 years. I know it was originally 2 cottages - what do you think? It is with deep sadness I convey to you the death of my brother Russell, peacefully, at his home in Colchester on Thursday 31st October. He was the eldest son of Alfred and Eleanor Crook who are both buried at All Saints'. He was the brother of Derrick (Torpoint UK), Alistair (Wellington NZ), Veronica (London UK) and Bill (Hamilton NZ). Russell was 81 years of age. Like me he enjoyed reading and contributing to the Wrington web page and will be greatly missed. Thank you Jo Lewis for the 1871 census info! Yes this is the right family. Jane Tidball was christened 12 Feb. 1809 in Huntspill, the daughter of John and Hester Young Tidball, she married George Derrick, 3 April 1832 in Blagdon. George died the first quarter of 1855 in Wrington. Thank you Richard for the wonderful Wrington website! David Ashley - Penkhull, Stoke onTrent, Staffordshire, 11th September. [I am[ researching the Ashley family in Wrington, Great Grandfather John Ashley, B:abt1853 in Wrington, son of John Ashley B:1825, father Robert Ashley, stonemason. Have records of my G/G to share with anyone who is researching the Ashley name and wants to add them to their tree. I have come across this info and wondered if it is of interest to Judi Pegg re her message, 4th September? Is it possible either to post it on the Schmooze page or send it to her by email? Many thanks for either. This Jane DERRICK is a widow living with son George at Oatlands, Wrington...that's the only address. Looking at the 1851 census her husband is George. Thank you Richard for being so informative and helpful! I don't have Ancestry World Deluxe this year and so I cannot look at the 1871 census and I forgot to copy it for my records, that might give an idea where Jane Tidball Derrick's home was in this photo. It is your webpage and you may put the photo wherever you want! I'm just happy to share the photo! You will note that I left the photographer info on when I cropped the photo. Please let me know if it comes out usable to you. Thank you so very much for getting in touch with me! I Googled the Derricks on the Wrington website and I don't think I am connected to any of them, I wish I were! George Derrick was born in Blagdon where I found them in 1841 and where he and Jane Tidball were married, by 1851 they had moved to Wrington, where my great-grandfather John Derrick was born. You will note on his memorial his tombstone says he was born in 1852, but he was in the 1851 census as an infant and he was christened in Wrington in 1851. 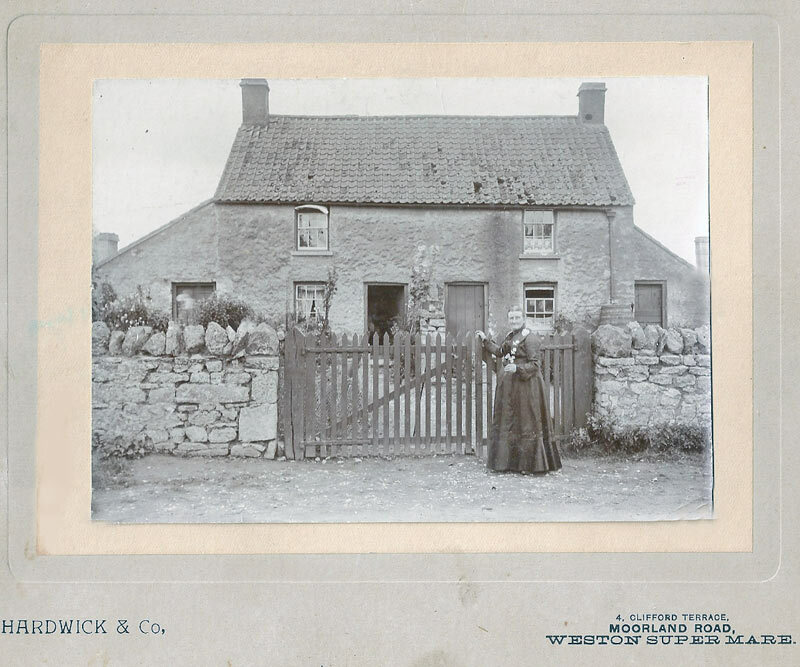 I have a photo of Jane Derrick, who died 1880, taken in front of her home in Wrington, would you like a copy of it for the website? Could you tell me what, Trustees Independent Chapel, means, under owner, from the rate book page? Does that mean they were living on parish owned property? I sent an e-mail to the All Saints office looking for what hopefully will be the exact dates that George and Jane Derrick died and to make sure that they are buried in the church yard. Thank you so very much for sending the rate book page and your help! I'm hoping to find some burial records for Wrington. George Derrick died about 1855 and his wife Jane Tidball Derrick died 1880. [Reply: Thank you for signing the website Visitors' Book. If you look to the All Saints' Homepage (see top of website Homepage), you'll see a link to the churchyard burial records. You can download a pdf file of the alphabetical list, which shows 2 under the name of Derrick, grave numbers 377 and 610. If you then look at the churchyard plan East Side, you'll see where they are. I'll have a look for them when I next go into the churchyard and see if I can photograph them - the gravestones may no longer be in place or be legible. I'll let you know. Meanwhile, I have some of the Parish Rate Books for the 19C, and your Derricks appear in those. I attach the entries. [Found the site via] John Parsley. 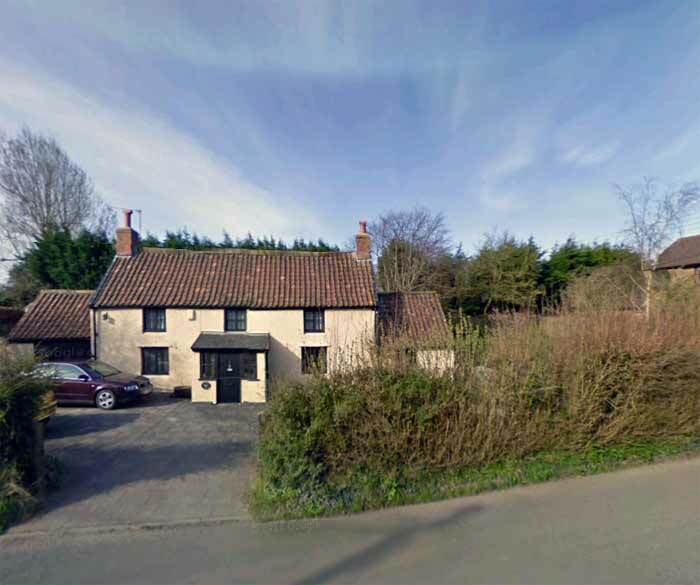 My mother was born in Priory Cottage. Her name was Catherine Parsley. I have been talking to Rose Parsley, my aunt, now 84 years old. She said the family moved from Priory Cottage when she was 7 yrs old, so they must have been living there in the 1920s. My Grandad was Albert Parsley, and his chidren were Margaret, Gladys, Rose, Charles, Percy, Catherine (my mother). The pictures I have sent you are Percy Parsley in his navy uniform, my Mum, Cath Parsley age 14, and a picture of the Parsley Family. I was once told by Bonnie Parsley of The Arch, Wrington, that Albert Parsley found a bolt-hole behind the fireplace in Priory House which was to do with Oliver Cromwell. I hope this information is of use to you.PS: you already have a photo of Percy as a small boy on your website. It was a glorious day [for Wrington's Garden Trail]: that’s the chief characteristic of the British climate, whenever fine weather is eventually encountered then it makes the day very special indeed. An historic occasion- well, for us anyway: it was the first time in fifty years that both my sister , who is domiciled in Germany,and myself and wife, from Australia. have been able to successfully synchronise our movements and visit the U.K.simultaneously. A time to wallow in nostalgia, perhaps ? We arrived on the evening of the 31st.May and made for “The Plough” for an evening meal duly washed down with Wrington’s own ale:- a fine brew, perhaps attributable to the River Yeo water.Then it was off to Rickford to our B & B before returning on the morrow. As luck would have it, we visited Wrington on the very day that the village’s Garden Trail was taking place. All those immaculate gardens resplendent with spring flowers and carpet-like lawns so smooth that you felt guilty about walking on them without first removing your shoes. Has Wrington changed in fifty-odd years ? Well, of course it has. Light industrial facilities and new housing stand where there were once fields, orchards, and a railway line. But it must be said that the recent dwellings appear, for the most part, handsome and in keeping with the rest of the place. The Post Office (we were there circa 1951-54) has been totally revamped with better use being made of the available space and sorting offices occupying what was once living room and kitchen. Our later residence at Cox’s Green (1956-59) appears little changed. But the essentials remain the same. We received a cordial welcome from the Rector and some ladies of the parish when we visited All Saints’. The school looks unaltered, at least from the road, with the former headmaster’s residence (Mr Waite in our day) now incorporated into the teaching area. Our following of the Garden Trail ended at “The Grove” where we were made welcome by Mrs Sarah Avery and her two grandchildren (with whom we hunted newts). But it was time to go. It is hoped that another fifty years will not elapse before we visit Wrington again. Sorry to have missed you,Richard. Just a big thank you for the lovely photos of Wrington from Old Hill. Having been born at Barley Farm in 1945 the views are a wonderful reminder of a very happy time all those years ago!.. Your web site gives so much pleasure. Thank you so much Peggy, I am a Woolf, Griffiths by marriage. My grandfather is John Charles Woolf. He is one of 13 children, and his dad was also John, his mum is Woodland.. So it would be his dad's side. We also have connections to Wrington, and we are based in South Wales. I would imagine that this is a Woolf connection which is also connected to my family. I have always been interested in the Wrington mentions which came about when a lady in UK was searching her family. I can no longer reach this person so I don’t know if she stopped the search. She definitely had so much information. I am pretty sure this is Josephine Smedley by the way. I have no longer gone on with this because frankly I am getting rather ancient and it takes good eyesight and mine is pretty poor now at ninety one. I do know that all the names and connections were correct and I can say that the name William Woolf is as far back as it goes. He was living in London in 1700 and was a perruquier. I imagine this was when wigs had to be cleaned and dressed and powdered every day. A new wig was extremely expensive . There is a wigmaker company still in London which dates back to the mid 1600’s and they invented a new way of making and keeping a wig so that it did not have to re done every day. I am sure it can be found on the web. A new wig now can cost up to five thousand pounds! Somehow I don’t think our William was a super rich man. Just my thought. The Woolf family is also connected to Sir John Smart who was a well known artist. He specialised also in ivory miniatures of lesser royals and military men. I know he went out to India and worked with many Rajahs who apparently were not good at paying their bills. I imagine the various servants could be blamed in some way. However he eventually came back to UK. I also have a vague memory that at one time he or one of his sons lived in the country manor that Queen Elizabeth I gave to one of her favourites - the one she called ‘Robin’ I think. Sorry names slip by me. I have a nice lithograph of John Smart since he is a grandparent going back a long ways. The original is still in a London Art museum. My branch of the family seemed to move more into South Wales and on the English borders. I think there is a family still living in Tredegar in S.Wales. I do have cousins still alive living in Cardiff. Name is Brister not Woolf now. Their grandmother was sister to my father, Richard Ivor Woolf. Worth checking I would say. John Smart disowned his younger son because when they were in India he got into trouble with one of the English maids. They were sent back to UK in disgrace and married and had more children but I don’t think he was much of a success during his lifetime. It’s an interesting family but then so many families do develop in a dramatic way. My surname is Woolf and a lot of the information on [this website] I believe is tied with my family. Could you please pass my email to anyone who is looking for any information on the Woolfs, thank you very much. [In the 3 photos of the Brownie Panto in the Archive <http://www.wringtonsomerset.org.uk/archive/1970browniespanto.html> I'm in the top photo of the three [back row no 2. I lived at Branches Cross Cottage, bottom of Wrington Hill. I am very interested in reading on the website about the Parker family of Havyat and I am hoping someone can add to my research on my branch of it. My great grandmother was Mary Jane Parker, born in Wrington in 1847. Her parents were Samuel Parker and Charlotte Stallard. They lived at Havyat Farm, but I don't know for how long. In the 1851 census Mary Jane is in the home of her widowed Grandmother Elizabeth Parker. Samuel and Charlotte married in Bedminster in 1838. Both Charlotte's father, who was called George Stallard and Samuel's father, William Parker have given their occupation as "yeoman" on the marriage certificate. I wonder if anyone has any knowledge of George Stallard, his wife or other family members. Samuel's parents were William Parker and Elizabeth Hancocks. Mary Jane moved to Newport, Monmouthshire, and went into service. She married David Williams Davies from St Bride's Wentlooge. He too came from a farming community. They had about seven children and Mary Jane died when she was only 46years old. Edgar Amor was my uncle who died in the First World War. I heard my father Arthur Amor mention Charlie Viner but I have no other knowledge of him. I also remember Mr.Sullivan who ran the Bakery at the end of Broad Street. Sorry I cant be of more help. Found the website through researching my family history, as I am trying to find out about my great great grandfather Charles Viner (baker in Wrington, early 20th century) and his family, and Edgar Amor and John Sullivan, who married my great-great aunts Edie and May. Excellent website, full of so much information!